Henry Wyatt was born in Yorkshire, England in 1460. His parents were Richard Wyatt and Margaret, the daughter and heir of William Bailiff. Both Henrys were born during the War of the Roses – a series of battles between two rival branches of the Royal House of Plantagenet. The houses of Lancaster were later signified by a red rose, the houses of York were later signified by a white rose. Lady Margaret Beaufort was 12 years old when she was married to Edmund Tudor – aged 27. She was only thirteen when Henry Tudor was born and the delivery was so difficult she was told she probably couldn’t have more children. Then she was widowed before her son was born. Edmund was captured by Yorkists and imprisoned at Caermarthen. Plague broke out and he died two months later. Lady Margaret became an intelligent, ambitious woman. Despite other marriages, Henry remained her only child. She would exert a powerful influence on him and his all of her life. Henry Tudor’s father Edmund and his Uncle Jasper were borne of a scandalous affair between Queen Katherine of Valois and Owen Tudor, her Welsh Clerk of the Wardrobe. It is said that the dowager queen had married him in secret. Whatever – Henry VI, legitimate heir to the throne, made his half-brothers earls. Edmund became Earl of Richmond and Jasper became Earl of Pembroke. Both were dedicated to the Lancastrian side of the War of the Roses. Henry Tudor spent years in exile. 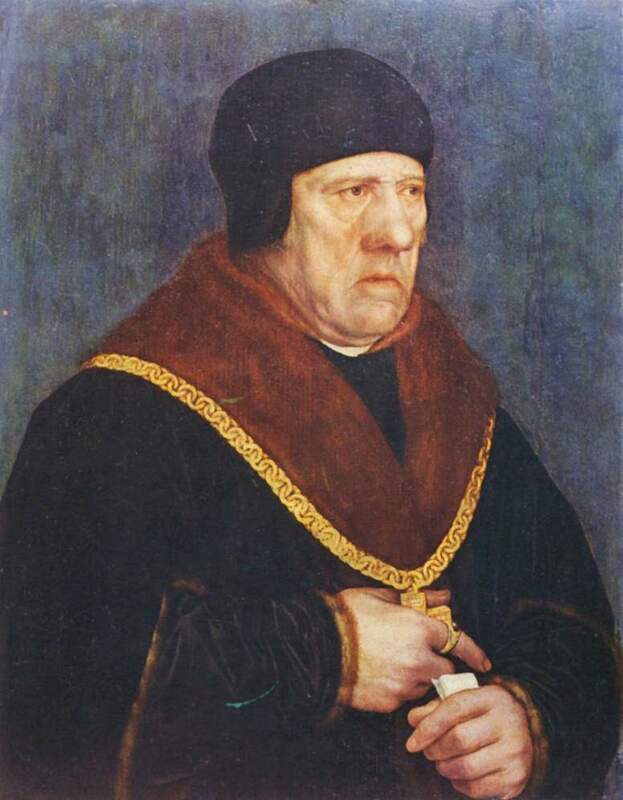 Henry’s grandfather, Owen Tudor, was executed by Yorkists. Other Beaufort relations died in bloody battles against the House of York. In 1471 his half-uncle, King Henry VI was captured and murdered after the Battle of Barnet. The next closest heir in the Beaufort line was Henry’s mother Margaret; since a female heir was unacceptable under those circumstances, her son Henry was in grave danger. Lady Margaret Beaufort was the great granddaughter of John of Gaunt. (We share this ancestry through Lady Elizabeth Brooke.) John of Gaunt was a member of the House of Plantagenet, the third surviving son of King Edward III of England and Philippa of Hainault. He was called “John of Gaunt” because he was born in Ghent (in today’s Belgium), then called “Gaunt”. In terms of ascendancy, there was a big problem with the Beaufort line. It started with a young girl Katherine who was made third wife to Hugh Swynford, a Lincolnshire knight. After his death she a widow for many years. During that time she became the mistress of John of Gaunt. Their four children were surnamed Beaufort. After they finally married in January 1396, their children were retroactively legitimized by the Pope and Richard II. HOWEVER: Henry IV had added a provisio that no Beaufort should ever succeed to the throne. When Edward IV died in 1483, he left his throne to his twelve-year-old son, Edward V. Edward ruled for two months, with the “help” of his Uncle Richard, who was named “Lord Protector”. Richard would come to be known as one of England’s most irredeemably evil kings. Shakespeare, Thomas More and others described him as deformed – but that was a time when deformity and evil were thought to be one in the same. Shortly after Edward IV’s death in April, a propaganda campaign insinuated that Edward’s marriage had been invalid and his sons were therefore bastards, ineligible for the throne. In June the claims were endorsed by an assembly of lords and commoners. On June 26 – the day after the assembly – Richard began to rule. In July he was crowned Richard III. In August, both of Edward’s sons disappeared. If you vaguely remember a story about the two princes who “mysteriously disappeared” from the tower, this is that. The boys were 12 year old Edward V and his nine year old brother Richard, Duke of York. They disappeared in August of 1483, two months after Richard was crowned. It was widely assumed that if Richard didn’t kill them himself, he had it done. Their bodies have never been found. That same year, Jasper won support for an invasion scheme. The timing seemed right, but the weather was against them. Around this time Henry Wyatt stepped up by taking part in the Duke of Buckingham’s failed revolt against Richard III. Tortures were designed to allow the prisoner to live long enough to confess pretty much anything they wanted confessed before the individual died. The medieval arsenal for infliction of agony was beyond imagination; in coming years it would play a starring role in the Spanish Inquisition. Henry was racked; that involved being tied across a board and bound by the ankles and wrists. Rollers would pull the body from opposite directions, resulting in stretching and extreme pain. The severity of the torture depended on the “crime” and social status of the victim. In prolonged use, limbs would be dislocated or torn from their sockets. Henry was also tortured with “barnacles”. The victim’s upper lip was pulled through a noose, tightened and twisted until the prisoner was in absolute agony. In some cases, it resulted in mutilation. Judging from this painting of Sir Henry years later, it appears that may have been the case. During his imprisonment Henry was on the verge of starvation, sleeping in tattered clothing on a thin straw mat in a cold room. Simons shares one account of a family legend. “Among other things, he was forced to swallow mustard and vinegar, and was on the verge of death from starvation. Then, so the story went, he made a pet of and fondled a stray cat, whom he ‘laid … on his bosom to warm him’. Puss grew so attached to him that each morning she deposited at his feet a pigeon pilfered from a neighbouring dovecote, which was later cooked for him by his compassionate jailer. The family of Wyatt cherished for many years a half-length portrait of Henry in his cell. There in the picture, sure enough, is the cat, dragging through the grating of the cell a pigeon, which she is about to deliver to the prisoner. The painting is, however, not contemporary, having been produced long afterwards. It is, nevertheless, recorded that thereafter Henry Wiat ‘would ever reck much of cats’. Henry Tudor had not forgotten his friend. In August of 1485 Henry Tudor and his forces landed in South Wales and headed east to do battle with Richard. Henry was sorely outnumbered at Bosworth, but Richard suffered a personal defeat – several of his most important lieutenants defected. It is said that the king told Henry “Study to serve me and I will study to enrich you.” And that’s exactly what happened. In 1492 he was appointed Esquire-of-the-Body, King’s select Bodyguard. He sold “Hall in the Village Solhange” (South Haigh or Upper Haigh) that he had acquired through his first marriage to Margaret, daughter and heiress of Richard Bailiff of Barnsley. Henry purchased and restored Allington Castle; Henry VIII and Cardinal Wolsey visited him there. In 1502 Henry married his second wife, Anne Skinner, daughter of John Skinner of Reigate in Surrey. (One record suggests she was a sister of the Earl of Surrey, but we have no proof.) At the time of their marriage Henry would have been 43 – that was OLD in medieval times. His famous son, Sir Thomas Wyatt the Poet was born the following year. There’s a lot more to it than this. Over the course of his life Sir Henry received titles and honors from Henry VII and Henry VIII. That information will be in the book.